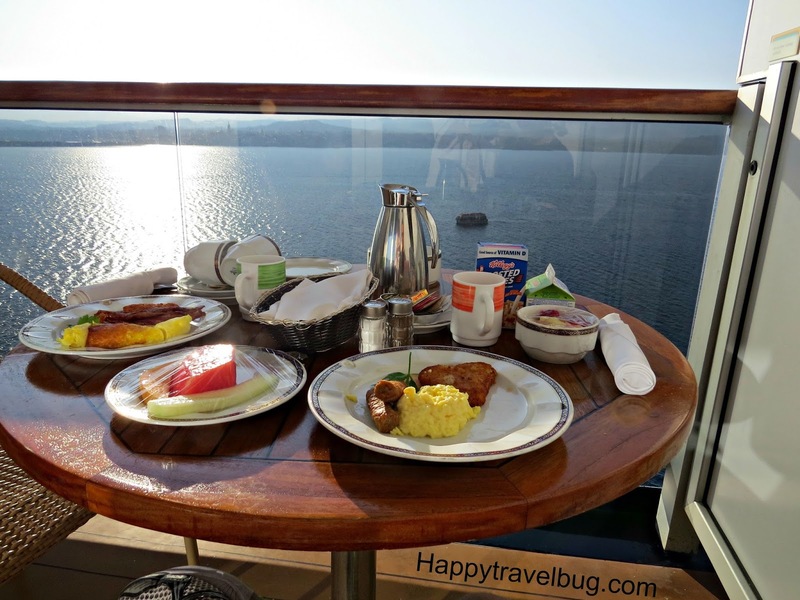 Just like every morning on our Mediterranean cruise, we started with room service breakfast on the balcony. Not a bad way to start any day. Then we were off to explore Monaco, Eze and Nice. It was going to be a big day of exploring, so we loaded up on breakfast, pretty much skipped lunch and ended the day with dinner in the main dining room. Vacation eating can be a bit different. 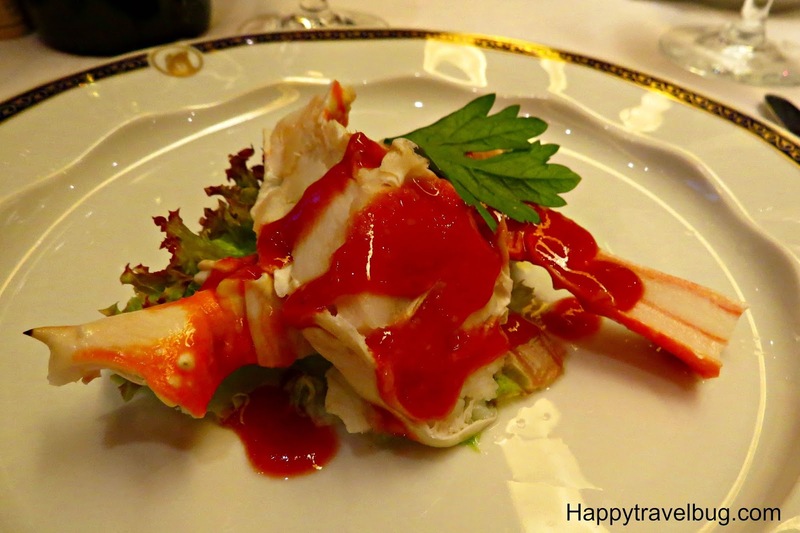 Do you eat the same on vacation as you normally do at home? I started with the Mille-Fuelle of Duck Pate. 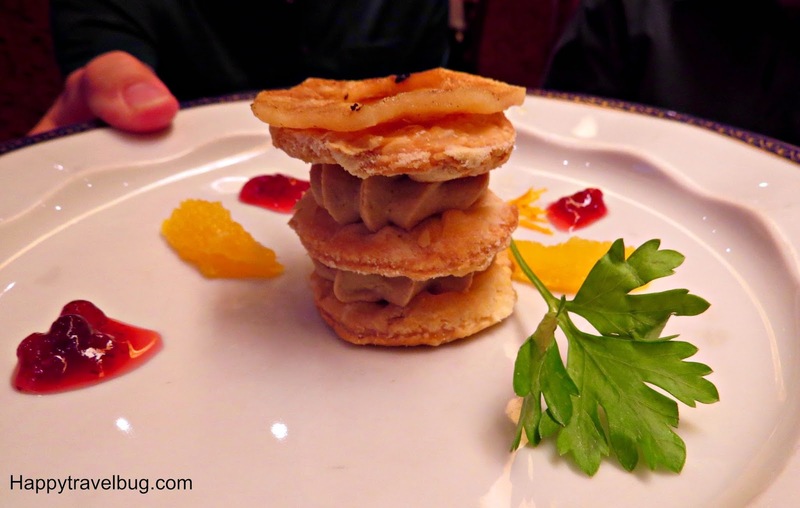 It was duck liver pate between puff pastry with a grilled pear on top. I love pate, but this wasn’t my favorite. I would have preferred a baguette instead of the puff pastry. Not bad though. My son had chilled Alaskan Crab legs. He loved them. They were good, but I like my crab legs served warm. Once on an Alaskan Cruise we had these chilled straight out of the water. Hard to beat that. 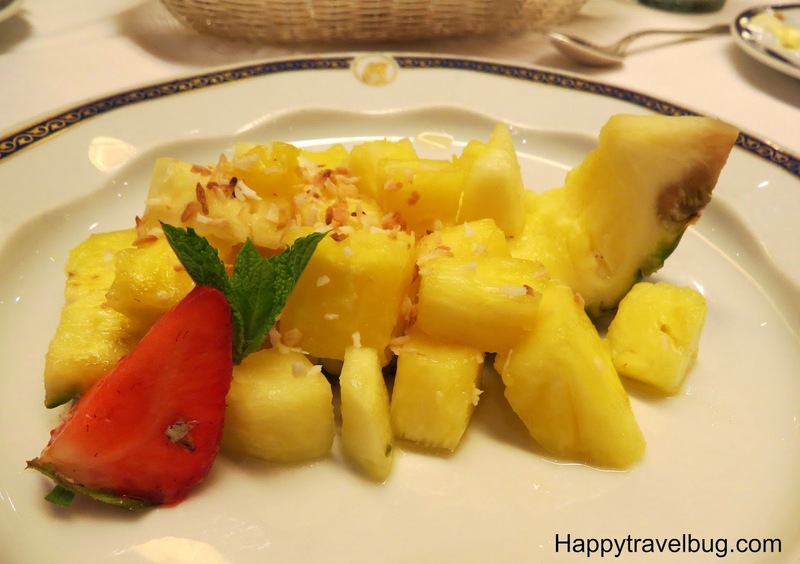 My daughter, who always gets the fruit, went with the Pineapple Boat dusted with toasted coconut. Not much to say about this. It was what it was. We tried all three of the soups they were offering. From left to right: Chilled Blackberry, Dutch Pea and Duck and Sausage Gumbo. The winner was the Dutch Pea. It was the perfect thickness and had just the right combination of vegetables with meat. The chilled blackberry was more like a dessert than a soup. I was most disappointed with the gumbo. We lived in Louisiana for several years and this is not what I would call gumbo. Not thick enough and missing all the yummy bits of sausage. 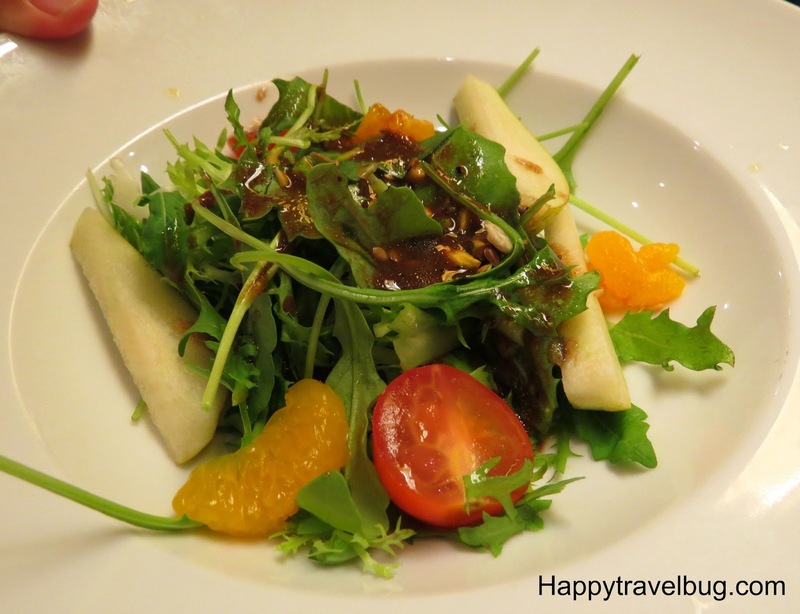 The Arugula salad was light and refreshing with the olive oil and balsamic vinegar dressing. Now on to the entrees. 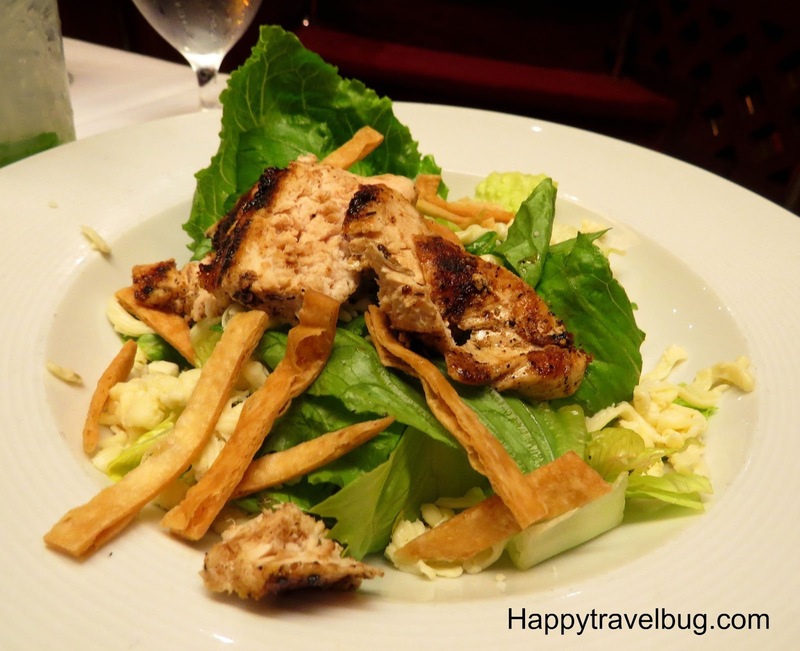 My daughter got the cajun chicken caesar salad. The jalapeño cheese was a nice touch along with the cajun chicken and garlic dressing. 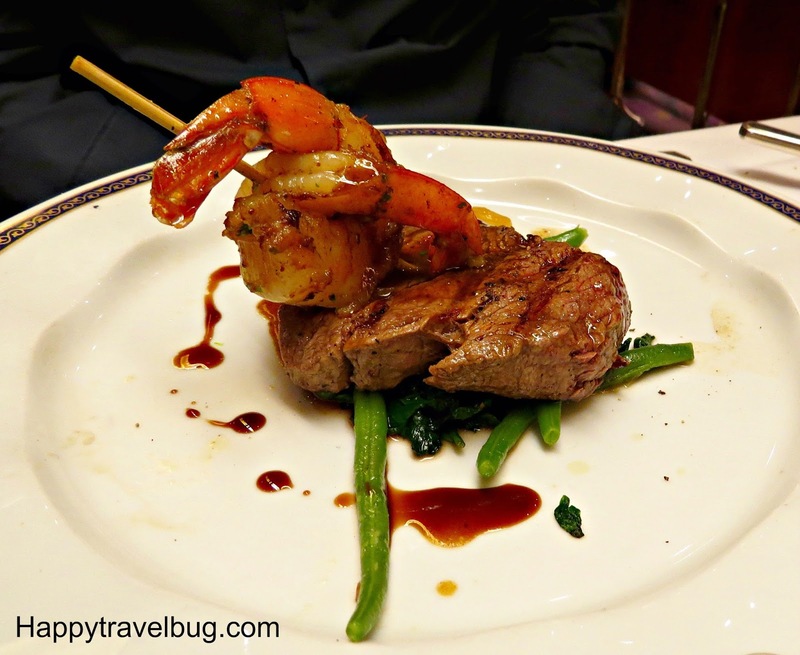 My son went with his usual meat choice…cracked pepper tenderloin with grilled shrimp. They were sitting on green beans and spinach. It was gone in seconds! 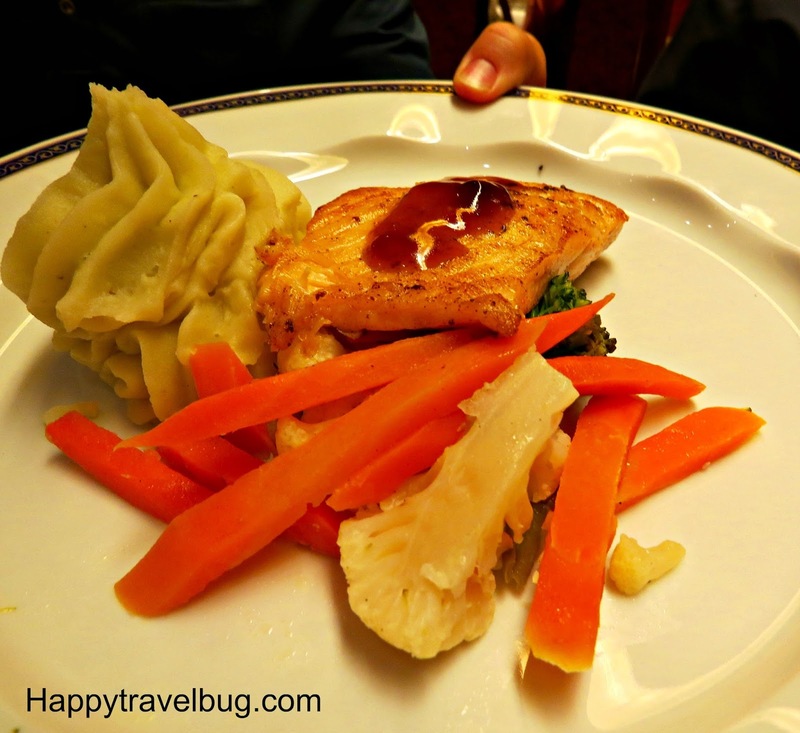 Every night you can order basics like this salmon, vegetables and potato side. That is what my husband went for on this night. Basic, but tasty. And I went with the Maple-lacquered duck breast. 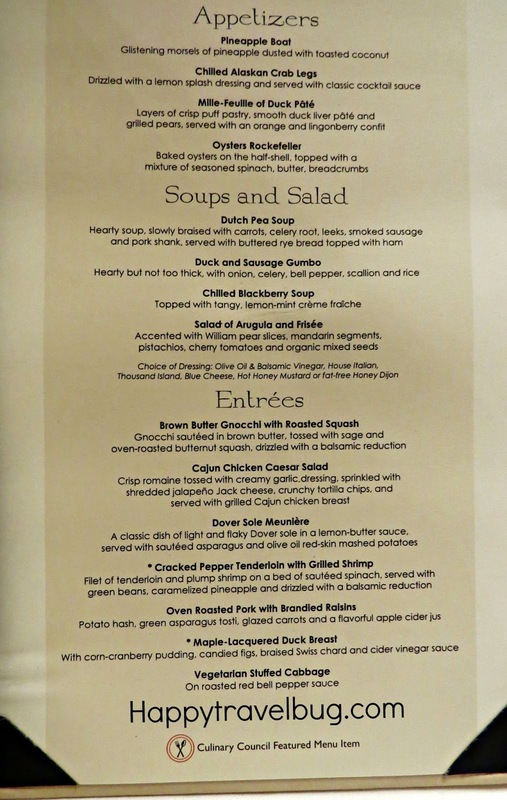 On a trip to London many years ago, I had duck for the first time and was in love. 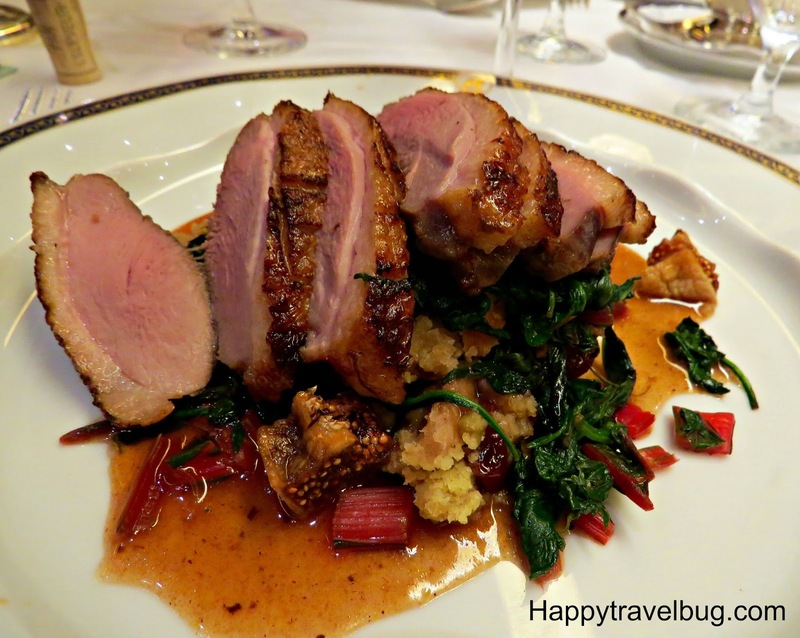 This duck was really good, but nothing has ever lived up to that meal I had at Maggie Jones in London. Dessert time!!! What would you pick? Another choice from the basics menu. 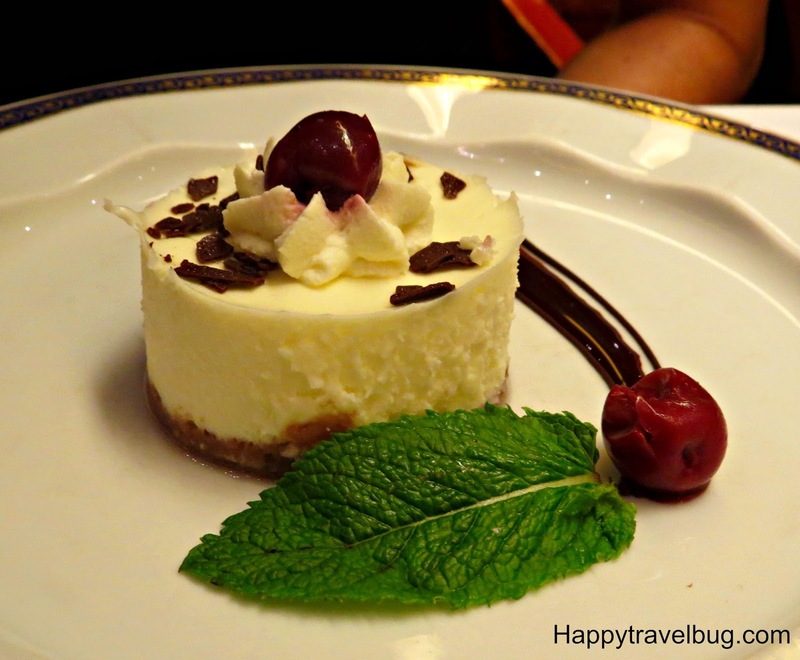 There was always a cheesecake option and my husband decided to go for that. I don’t really care for cheesecake, so I didn’t bother with this one. 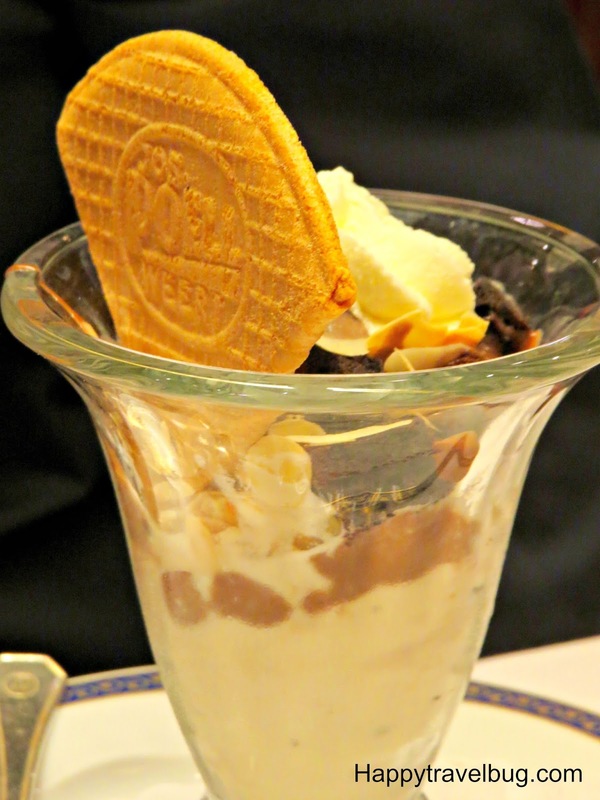 A brownie hot fudge sundae was shared by all. Can’t go wrong here. 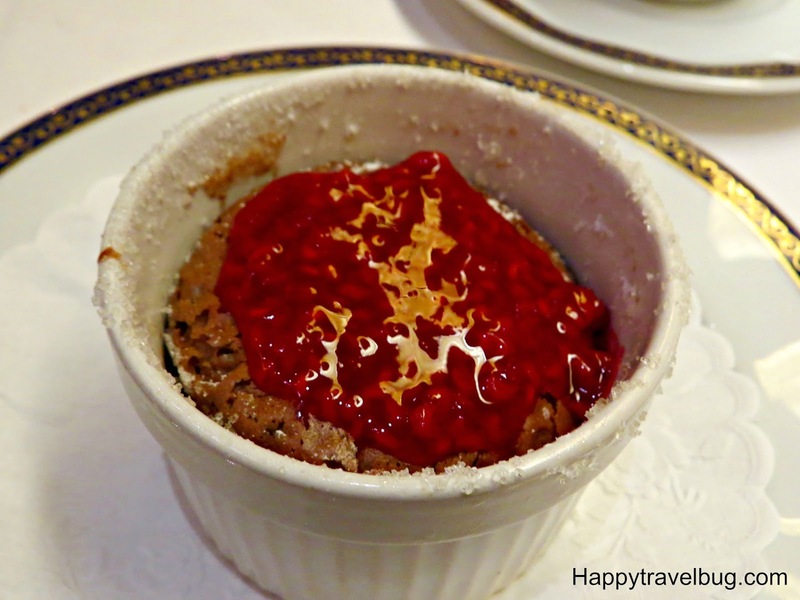 I had the chocolate-espresso souffle with raspberry sauce. It was yummy, but lacked the espresso kick I was hoping for. Another Wednesday, another great day of food. Thanks Holland America!